A Den of Sin or a Beacon of Liberty? 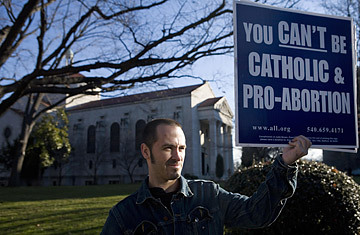 The U.S. Catholic Church's crusade against the Freedom of Choice Act (FOCA) has all the hallmarks of a well-oiled lobbying campaign. A national postcard campaign is flooding the White House and congressional offices with messages opposing FOCA, and Catholic bishops have made defeating the abortion rights legislation a top priority. In the most recent effort to stop the bill, Cardinal Justin Rigali of Philadelphia sent a letter to every member of Congress imploring them to "please oppose FOCA." There is only one hitch. Congress isn't about to pass the Freedom of Choice Act  because no such bill has been introduced in the current Congress. The campaign against FOCA, which would essentially codify the Roe v. Wade decision by saying the government can't place limits on abortions performed before viability, began shortly after Barack Obama's election in November, at the annual general meeting of the U.S. Conference of Catholic Bishops (USCCB). In a unanimous decision, the bishops voted to "mobilize the resources of the USCCB, dioceses and the entire Catholic community" to oppose the act. When Jan. 22 came and went without a Freedom of Choice Act becoming law, the USCCB's Committee on Pro-Life Activities announced a nationwide postcard campaign to blanket congressional offices and the White House with appeals to stop FOCA. Anti-FOCA groups on Facebook soon had more than 150,000 members and added thousands more each day. Priests started preaching against the legislation, and churches began circulating petitions to oppose its passage. In the midst of all this activity, the fact that there was no Freedom of Choice Act before the 111th Congress went largely unnoticed and unmentioned. Congressional Democrats have also been less than enthusiastic about the proposal. A spokesman for Nadler says that while he expects the legislation to be reintroduced, "it won't be anytime soon." Even if FOCA is reintroduced in the current Congress, Speaker of the House Nancy Pelosi has indicated she has no intention of bringing it up for a vote. And even if she did, there are not enough votes in Congress to pass the bill. In some respects, President Obama has only himself to blame for the current controversy. As a presidential candidate, the then Senator himself pointed a spotlight on the legislation he co-sponsored when he told the Planned Parenthood Action Fund in 2007 that "the first thing I'd do as President is sign the Freedom of Choice Act. That's the first thing I'd do." But FOCA has provided ammunition for those on the right who want to paint Obama as "the most pro-abortion President ever." It's been less than a month since he took office, but so far the President has given social conservatives little evidence to back up that charge. He did repeal the Mexico City policy banning the giving of federal funds to foreign family-planning organizations that provide abortion referrals or services  but so did Bill Clinton. At the same time, Obama has directed his Presidential Advisory Council on Faith-Based and Neighborhood Partnerships to make the issue of abortion reduction one of its top priorities. Still, FOCA is proving to be the perfect political issue for anti-abortion advocates  and for congressional Republicans, who have taken up the cry as well. Unless and until FOCA is voted on by Congress, they can invoke it as a looming threat. And the longer it remains a dormant issue, the more credit they can take for their own "proactive" efforts to "defeat FOCA," as a letter from House Republicans to Cardinal Rigali on Tuesday put it. James Salt, director of organizing for the progressive organization Catholics United, thinks the USCCB has been prodded into focusing on FOCA by misinformation from conservative groups. "These right-wing organizations are deliberatively misleading people in order to stoke the culture war," says Salt. "They're using this as a fundraising tool, as a way to gin up their relevancy. And unfortunately, some of these groups have the ear of certain bishops." After worried parishioners started contacting Catholics United about the postcard campaign, the group sent out an alert to its supporters telling them that "FOCA is not going anywhere" and urging them to contact their local bishops. "In this time of increasing job layoffs, poverty, and food insecurity across America, we should instead be calling on Catholics to commit increased resources to helping children and families survive the collapsing economy," read the message. Some of the USCCB's own policy staffers are reportedly frustrated by the attention given to FOCA. And a few Catholic officials have even taken the rare step of speaking out to correct misinformation about the issue. While the USCCB's literature about FOCA has been generally accurate, the chain e-mail has disseminated a number of false claims, including warnings that the proposal would force Catholic hospitals to shut down and lead to at least 100,000 more abortions each year. Some versions of the e-mail even claimed that FOCA could "result in a future amendment that would force women by law to have abortions in certain situations  and even regulate how many children women are allowed to have." In response, Catholic News Service  the official news agency affiliated with the USCCB  ran an article that began, "Internet rumors to the contrary, no Catholic hospital in the United States is in danger of closing because of the Freedom of Choice Act." Sister Carol Keehan, president and CEO of the Catholic Health Association, told the news agency that the legislation "has never contained anything that would force Catholic hospitals or Catholic personnel to do abortions or to participate in them." She added, "I don't believe that FOCA will pass." Read TIME's 2000 cover story on the abortion pill.